This unique book is designed to help today's podiatrist manage an ever-increasing flow of information. The book's editorial team has studied hundreds of publications—mainstream podiatric journals as well as those from related fields—to hand-pick the most significant articles in each subject area from the last year. Each article is expertly condensed in an easy-to-read, standardized format. Accompanying each section is a commentary by one of the journal's section editors, which shows how the information in the article can be applied in practice. Also included are illustrations and key references for further reading. 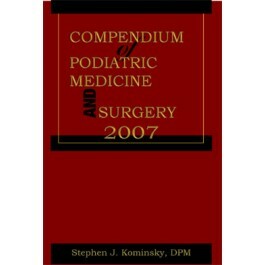 Compendium of Podiatric Medicine and Surgery 2007 is updated on a yearly basis and your subscription is automatic with the purchase of this publication. Subsequent books will be sent to you automatically and billed at the then-current prices. If you do not wish to receive any updates, you must write a letter with your name, company name, address, phone number, and publication, to cancel your subscription. Cancellations may be faxed to 410-494-0515 or mailed to Data Trace Publishing Company at P.O. Box 1239, Brooklandville, MD 21022-9978. Editor-in-Chief: Stephen J. Kominsky, D.P.M., F.A.C.F.A.S. Diplomate, American Board of Podiatric Surgery; Board Certified in Foot and Ankle Surgery; Residency Director, Director of Podiatric Medical Education, Washington Hospital Center, Washington, D.C. 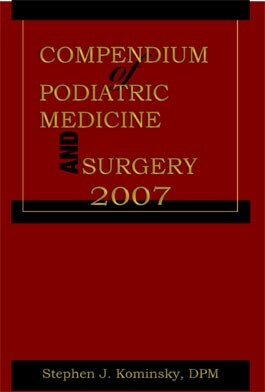 I am very pleased to present the Compendium of Podiatric Medicine and Surgery 2007. This Compendium, in addition to providing a fine review of the year's best medical literature, offers you, the readers, the option of earning up to 32 continuing medical education credits. Please see the enclosed information sheet and answer form for more details. As always, the Editorial Board has scoured the myriad of current literature, and selected and commented on what they believe to be some of the most interesting and significant articles in their areas of expertise. Artwork, references and additional reading suggestions further enhance the chapters. edited by Jason M. Weber, D.P.M. edited by Bruce Greenfield, D.P.M. edited by Stephen Silvani, D.P.M. edited by John S. Steinberg, D.P.M. edited by Michael Rupp, D.P.M. edited by John H. Walter, Jr., D.P.M., M.S. and Larry R. Goss, D.P.M. edited by James B. McGuire, D.P.M. edited by Ericka M. Schwartz, D.P.M. edited by Gary L. Dockery, D.P.M.